Located on beautiful Boca Ciega Bay in Gulfport, Boca Ciega Yacht Club (BCYC) is only four miles from the open waters of the Gulf of Mexico offering sailors easy access to west Florida's best cruising destinations as well as fabulous sailing on the protected waters of the Bay. BCYC members enjoy club cruising, racing and a full social calendar throughout the year. If you are not already a Member, we invite you to discover the many benefits of membership and join the most exciting and friendly sail club in Florida. Women, get your sailboat race on! The Rhumb Runners of Boca Ciega Yacht Club are sponsoring a PHRF sanctioned race for boats crewed by women only. The registration deadline is April 20, 2019. Coverage from The Gabber on Funday (click image to access article). 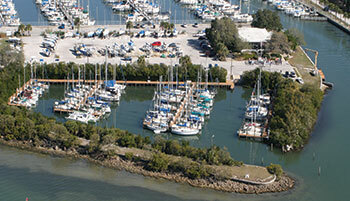 It has been verified that the Pass-A-Grille Channel navigational aids have changed. Due to heavy shoaling the old G7 is now a Danger Shoal (diamond card) marker. The old R6 is now G7 (I assume the red light was changed to green - still flashing a 4sec - TBD). If anyone can find the actual "Notice to Mariners" which covers this change please forward it to the webmaster. Information on this webpage is maintained by the Webmaster.